If you wish to study with us, I would encourage you to read the whole chapter first, marking the parts that stand out to you. Mark up your Bible! Write in the margins, underline and highlight as much as you want. This is your handbook for your life. USE IT. If you don’t have one, CLICK HERE for a free King James Version of the Bible. After you have read Luke One, then review it in these verse chunks while answering the answers in your scripture journal. I pray that Heavenly Father will manifest the truth of these events to you through the Holy Ghost as you study them. – What is a blessing or answer you are waiting or hoping for? – Based on Luke 1:4, what can studying the Gospel of Luke do for us? As you study the Gospel of Luke, they can come to “know the certainty” (verse 4) of the truths they have been taught about Jesus Christ. – What phrases might have helped Mary understand the importance of the task God was giving her? Think of the blessing or answer you are waiting or hoping for. – What do you think Mary or Elisabeth might say to encourage us if we feel that something we hope for is impossible? – What is an experience that has strengthened your belief that nothing is impossible with God? How is Mary’s response different than Zacharias’? What does she mean, according to thy word? How does that apply to your hopes and dreams? Read Luke 1:46–49 aloud. How did Mary praised the Lord? Look back at 38, 45–46 silently, looking for What Mary had done that allowed the Lord to do “great things” for her. 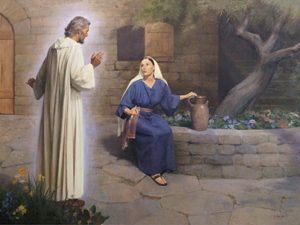 – Based on Mary’s example, what will happen in our lives if we faithfully try to fulfill the roles the Lord has for us? If we faithfully try to fulfill the roles the Lord has for us, He can do great things in our lives. VERSES 57-80 Is the psalm of Mary and the naming of John. AMAZING! – Do you feel with a certainty that all that is taught in Luke 1 is true? – What roles have the Lord given you to fulfill? How can you exercise your faith in His might as you strive to accomplish His will? – What great things would you like Him to do in YOUR life? What light has been shed during this study on the blessing or answer you are waiting or hoping for? Jesus Christ is the Savior of the World. His coming was foretold by all the holy prophets. The preparation for His earthly ministry was divine. Repentance and forgiveness and Eternal Life is possible ONLY through Him. He lives and blesses us everyday as we draw near to Him.